Patient presented with incongruous restorations and missing teeth in the upper and lower right quadrants. Patient would like to complete a rehabilitation with dental implants, but previous dentists he visited discouraged him to complete a similar procedure due to the severe bone atrophy. Dr Deliperi successfully completed the rehabilitation with dental implants of similar cases in the past. He decided to go ahead with a bone regeneration via a sinus lift procedure. In the same appointment, he was able to complete the bone regeneration (around 15 mm in high) and place 3 dental implant in the severely resorbed upper maxilla. Few months later, he completed both a bone regeneration and implant placement in the lower jaw too. After 8 months from the surgery in the upper jaw, Dr Deliperi completed a gingival plastic surgery and connected the implants with temporary crowns to test the masticatory function. 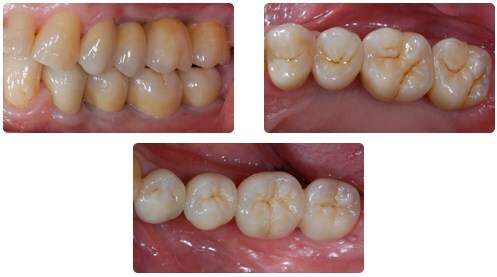 Following tissue healing and maturation, four full ceramic crowns were fabricated both on the upper and lower teeth. 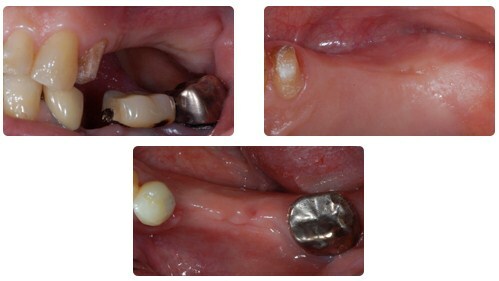 Full ceramic abutment were also fabricated for the implant-supported restorations. Final result following the cementation of full ceramic crowns on the first upper and lower natural premolar teeth and full ceramic crowns on the upper and lower implant supported second premolar and molar teeth. Crowns were not splinted to allow regular brushing and flossing. 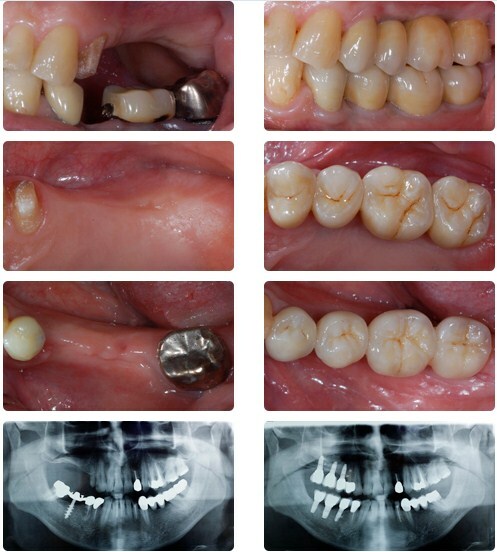 Both function and aesthetic were achieved in a very challenging case. The post-op X-ray shows the huge bone regeneration obtained around the upper dental implants.